In 1989 Casterman and Rijperman released the first color album version of the Johan and Stefan album “De Zondebokken” (“Les Bouts Emissaires” in French, and “De Geitenrijders” in the original Flemish version which was also the very first Snow en Snolleke album ever). For that reedition Bob De Moor would prepare a lot of different versions of the cover artwork. Today we present you one already which we found back in the collection of Olivier Marin and which was made for a Rijperman version in mind (the title is also in French and not in Dutch). 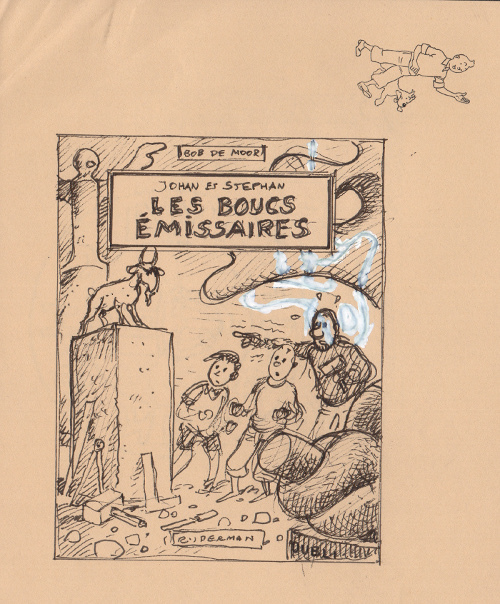 The drawing was made on drawing stationary from the Hergé Studios as you can see and is rather small, but drawn in a very swift and fluent way. The black and white drawing is quite different from the final version as you can see below. 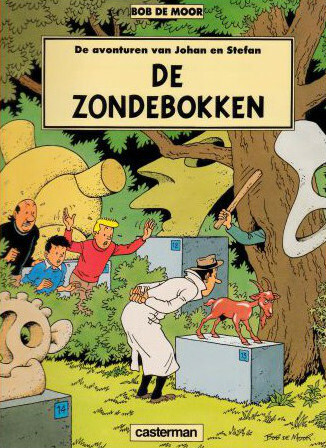 In this early version you see Snoe and Snolleke (renamed Johan and Stefan in the dutch version – Johan and Stephan in the French version) together with Uncle Zigomar (ridiculously translated Oom Watje in Dutch) looking at a goat statue placed on a high pedestal. Zigomar is holding a hammer, referring to his role as a sculptor in this album. You will notice that De Moor ‘deleted’ a sculpture in the background in order to make Zigomar more visible. Zigomar seems terrified of the statue, which is not really all that logical, it’s a statue after all. And that might well have been Bob De Moor‘s reason not to go into this direction. Add to this that compared to the final version this one has a lot less action, you just see the trio watching the statue. In the final version, you find inspector Evaristus who is about to be knocked down whilst watching a sculpture of a goat. Small detail, the scene presented on the cover artwork of the album never happened in the album, in reality Evaristus was watching an empty pedestal. 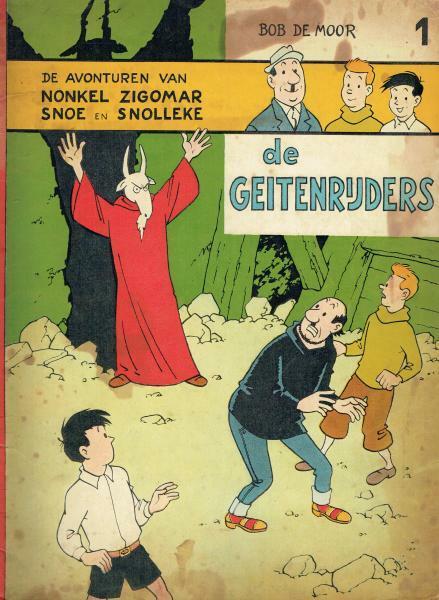 But Bob De Moor wanted to get the goat statue central in the drawing’s action. 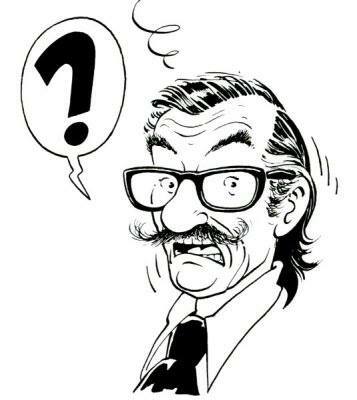 To get an idea how the cover artwork for the very first black and white album version from was, check this scan.